I make no secret of the fact that I’m a certified heels girl. Heels are obligatory for me; that’s not to say I haven’t dabbled with flat but they’re just not for me. I bought a pair of plimsolls which sat in the box for months, I’d just looked at them and think “what am I supposed to do with you?!”. When I eventually plucked up the courage and wore them to work, the entire office turned around in shocked silence – I wish this was an exaggeration! Recently though, I’ve been eyeing up midi heels with curiosity. Sure, a 4” heel gives you a little extra sassiness but there’s something so nonchalant about a chic midi heel. I know they’re not exactly revolutionary, they’ve been on the runway for seasons now, but the high street is really pulling out the stops with midi heels now. They used to feel a bit frumpy and neither here-nor-there; not a proper heel yet not quite a flat. This season, they’re souped-up with a bit of embellishment, animal print, metallic, jewels or just looking really, really appealing (she types in her 4.5” Rupert Sanderson stilettos). 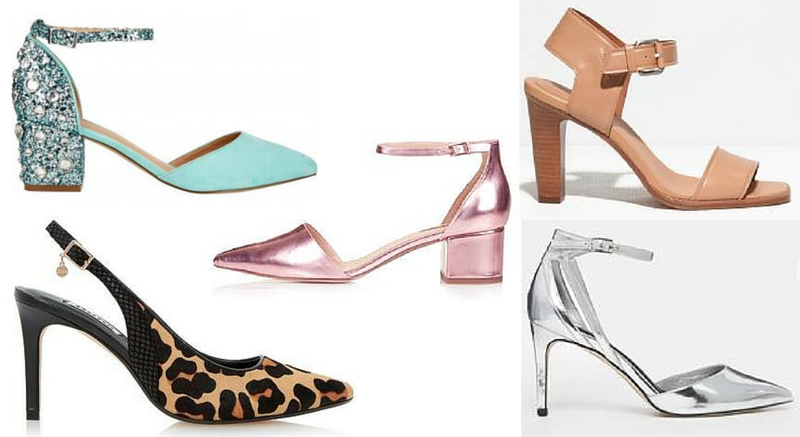 I may not be quite there yet but these beauties are seriously tempting me away from the big girl heels, especially those ASOS beauties!